I recently received the Sound Oasis Glo To Sleep sleep therapy mask for free for my unbiased review. I am not always a good sleeper, so I'm always seeking products that may help. The mask is made of a comfortable foam with an elastic adjustable strap to hold it in place. 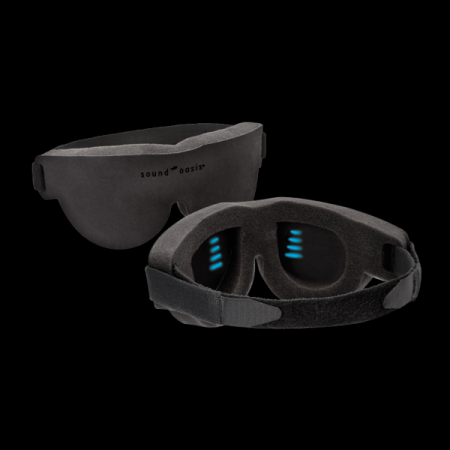 It has a series of strips in the inside of each of the eye covers that, when held up to light, glow blue and give you something on which to focus as you drift off to sleep. The mask is comfortable and adjusts to the eye area easily. The foam sides of the mask block any residual light and hold the mask comfortably against your face. If you are a back sleeper or if you are using the mask for meditation or for napping in a chair, you won't notice it after you fall asleep. You'll hardly know it is there because, while the elastic band holds it snugly, it is incredibly comfortable. If you are a side sleeper, however, the mask isn't comfortable for sleeping. I tend to be a side sleeper, and while I was able to drift off to sleep with the mask on while I was lying on my back, as soon as I rolled over to my side, I felt the straps of the mask against my face, which woke me up and I had to remove it. I wouldn't recommend wearing this mask for sleep if you are a side sleeper because of this comfort issue. I found the mask effective. I'm a thinker, which often keeps me awake. Having the gently glowing strips to look at allowed me a point of focus that served as a reminder to clear my mind and bring my attention back to the glowing lights. This was surprisingly effective, and I drifted off quickly. I would definitely recommend this for someone whose nighttime over thinking tends to keep them awake. The mask is easy to use. You hold it up to a light source for a moment or two and then put it on. It blocks out all other light completely, and all you need to do is maintain a soft focus on the glowing lights. If your attention wanders, Sound Oasis recommends gently returning it to the lights. There is nothing complicated about this mask so for someone who isn't a fan of high tech solutions for sleep, this is a simple, effective method that just may work for them. The mask costs between $30 and $40, which I found a bit pricey for foam with a few reflectors in it. However, compared to other sleep solutions, it isn't overly expensive and might be a good choice for someone looking for relatively inexpensive ways to enhance their falling asleep process. I recommend this mask for people whose busy minds keep them from sleeping, or for meditators who have trouble keeping thoughts at bay. However, if you are a side or stomach sleeper, use of this mask at night is unlikely to help you sustain sleep. In my home, I suspect the mask will remain in continued use for two specific situations: me when I meditate to help me focus, and for my husband when he needs to nap during the day because he is switching between day and night shift. At about $40, it's worth a try if you're looking for a drug-free, low-tech solution to help you fall asleep.